We would like to invite you to the 5th International Technical Symposium on Work at Height and over Free Depth which is traditionally held at the Polygon for practical training in Kladno on 20-21 February 2019. 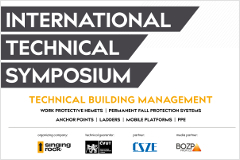 This year's program covers the topic Technical Management of Buildings, focusing on permanent fall protection systems, use of mobile scaffolds and platforms, ladders, PPE for work at heights and above the free depth, the legislative framework and others as detailed in the program flyer. Take advantage of this unique opportunity to meet experts and funded specialists in the field not only from the Czech Republic, but also from France, Poland, Austria and others. A simultaneous translation of lectures is provided.